Unlike most of my Musings, this one is instructional since I wanted to give those using a similar piece of equipment another option. 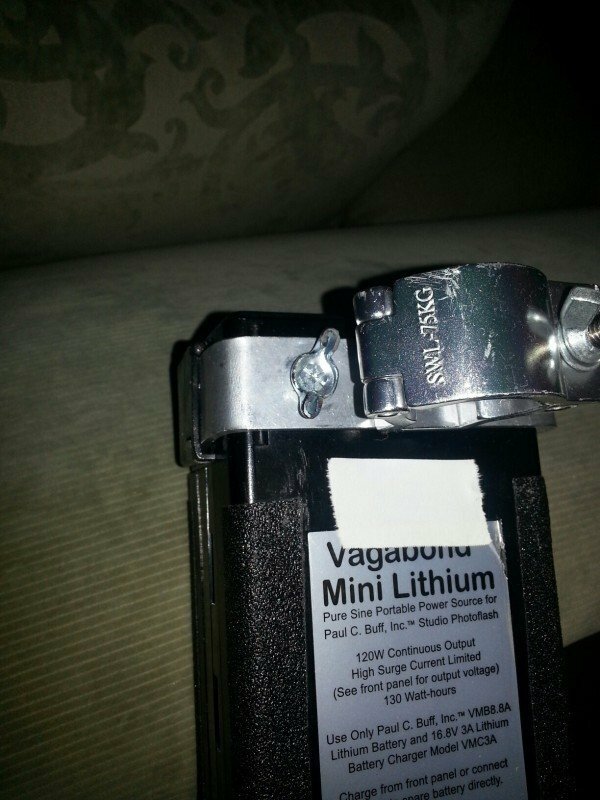 I have used Paul Buff’s Vagabond Mini Lithium battery for some time, but have not been happy with how to mount it to a light stand. Stable, does not swing around the stand. I can bring the legs up on the stand without removing the mount. It must fit well in my gear bag, not taking a lot of space or weight. I could not find any solutions on the web and the closest I could find was on Rob Galbraith’s site (Rob no longer updates his site, I miss his articles!) . Some of the options were just too fragile or too bulky for the amount and type of work I do in the field. The closest solution was his GT Truss Clamps (which I’ve used in my own solution) however I was still very concerned about using only the female mounting socket to bear the weight and shock of placing a stand up and down during a session. Because I use stands of varying shaft diameters I made a shim out of a piece of PVC tubing that matches the diameter of the stand’s outer diameter as well as the 1.34 inch diameter of the GT Truss clamp. The aluminum flat bar stock I’ve used can be sourced at any hardware store. I prevent the band that goes around the Mini from spinning on the GT Truss clamp by tapping a small Allen Set screw into the aluminum truss clamp and then drilled a corresponding hole into the band. This prevents any spinning of the unit. 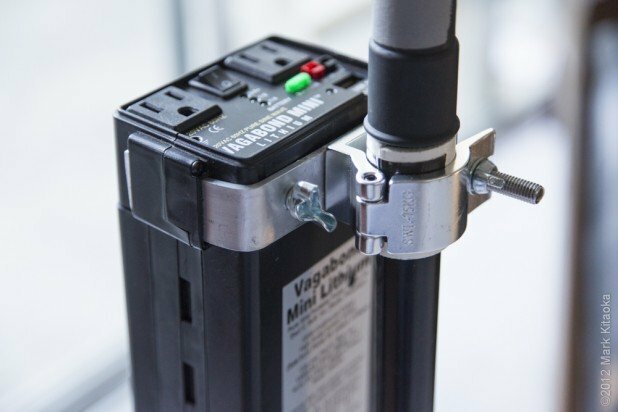 The band of aluminum uses the strap mounts on the Vagabond Mini thereby keeping the weight of the unit off of the built in 1/4 20 female stud. The diameter of this stand section is the same as an Avenger C Stand. 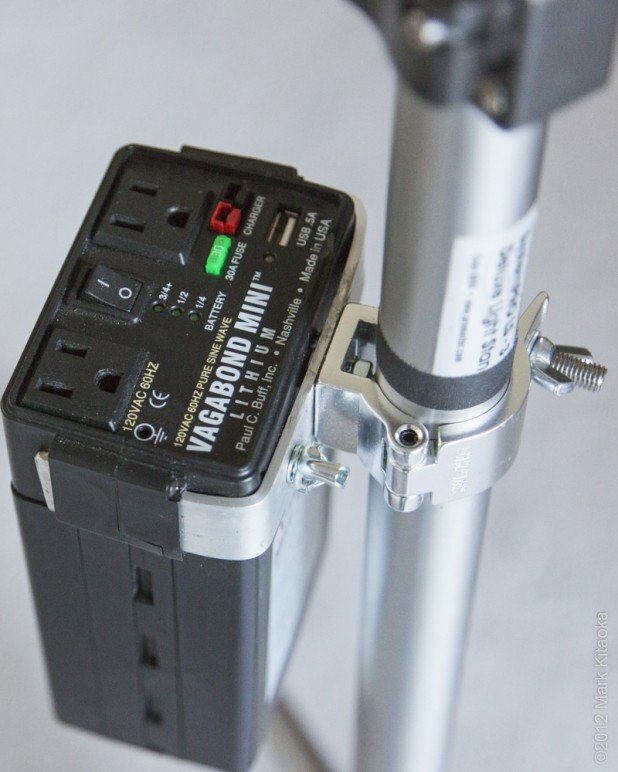 Finally for the very smallest stands I use in the field I purchased the 3/4 inch GT truss clamp and swap out the Vagabond Mini with this holder when I plan on using stands like the Manfrotto Nano Stand or my Cheetah Stand. With this setup I am now able to confidently take my Einstein and Mini on any location shoot and my assistants are able to easily bring the legs up on the stands and quickly move to another location without the worry of having the Mini moving about the stand. To save space in our gear boxes, we can remove the mounts from the Mini units which prevents odd sized packing. I have found this to be the best solution for my needs. 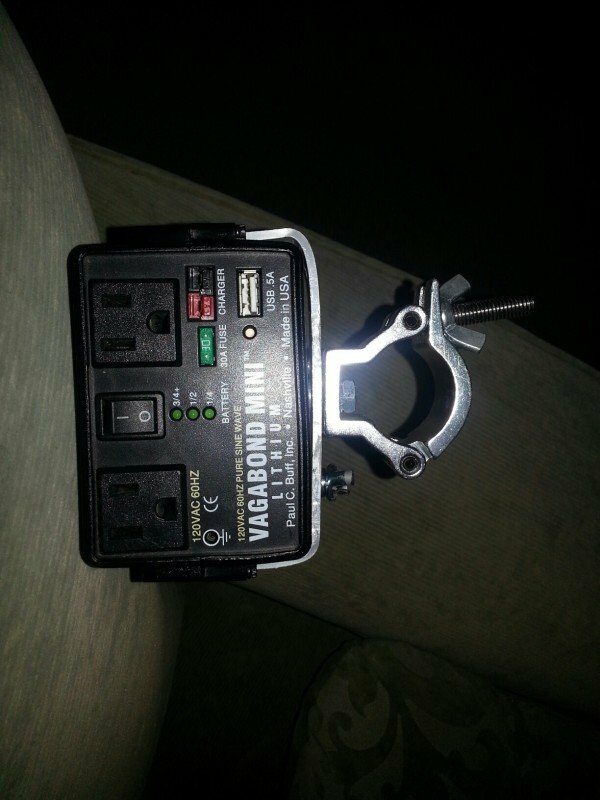 I love your setup for the vagabond mini. I have no joke been looking into the ultimate rig for like 6 months and just came across your site and very glad i did. I had a few questions on your setup with the vagabond mini. First off what is attached to the aluminium on the opposite side where the truss clamp is attached to it. I thought it may be a nut or screw but hard to get a good look from the photo. Second is when you bought the aluminium did you bend it yourself and how did you do it. Any tips that is not listed that you can suggest before I do the same thing? Here are two photos that may help you. 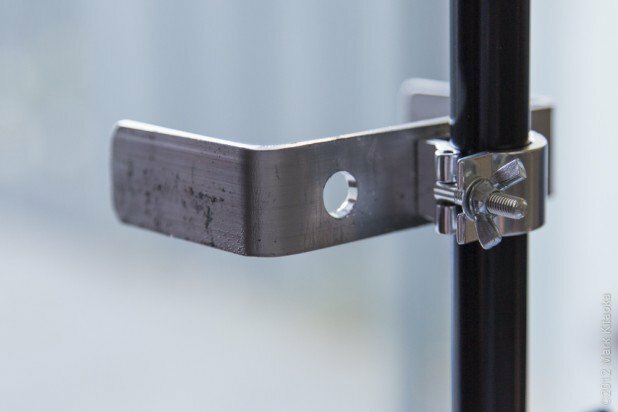 Also be sure to use a set screw on the truss clamp to keep it from rotating on the single bolt. For bending I used a bench vice and then measured to the inside of the bend for the other side. It isn’t pretty but it works well.